Sankisa, located at a distance of around 40 km from Kannauj in the Farrukabad district of Uttar Pradesh State, is counted amongst the pilgrim destinations for the Buddhist. The place is related to many mythical legends related to Buddha. Among the famous one is, it is here where Buddha, along with Brahma and Devraj Indra descended from heaven by a ladder of gold after giving a sermon to his mother in heaven. At the spot of descent, stands a temple with a statue of the Lord Buddha. The place is known for Mauryan Emperor Ashoka's Pillar. The most important attraction of Sankisa is a Buddha temple situated at the spot where the Lord Buddha descended after his stay in the Tushita heaven. The temple houses a statue of the Buddha. Sankisa is also mentioned in the ancient epic Ramayana. Known as Sankasya in Ramayana, it has been a major centre in the geography of India from earlier times. The famous Chinese Traveller, Hiuen Tsang, named Sankisa as Kapittha in his travelogue and described it as a nice place to visit. He also recorded the construction of ladder by the local prince at the site of the original ladder. Sankisa is mainly famous for the archaeological and historical importance. 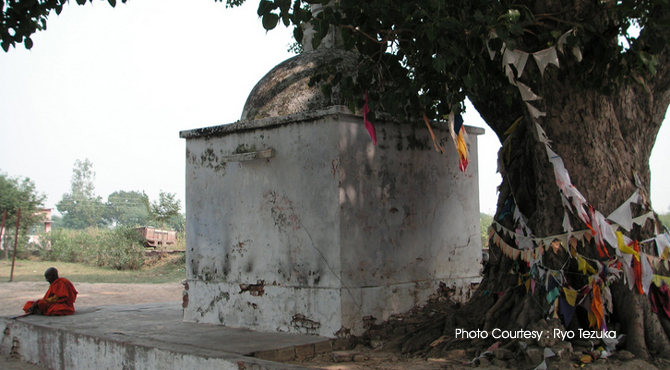 There is a small temple dedicated to Bisari Devi where, she is worshipped as a goddess of fertlity. An excavated Ashokan Elephant Pillar, a Mega Tank, Buddhist sculptures dating back to Mahayana age are also found on some walls at the site. The remains of Asokan Pillar is worth a visit. The pillar here has an elephant. This elephant is said to be the representation of the white elephant which mayadevi had dreamt at the time of conception of Siddhartha (Lord Buddha). The excavations by the Archaeological Society of India (ASI) has lead to the finding of many points of ancient age contemporary to the Buddha, Asoka and some other well-known preacher of Buddhism. Some of these details are exquisite and represents a high grade of artistic creation. The scriptures, terra cotta figures, bronze coins and stone dishes remain the center of attraction for the visiting folk to have a glimpse backward into the far left times. The Shiva linga is also quite exotic and attracts Hindu religious devotees. A large fair Shravan Mela is held every year at Sankisha in the month of Shravan (July - August) which attracts a bunch of tourists. Situated 80 kms from Kanpur on the banks of the river Ganga, Kannauj is an ancient town in India. Formerly known as Kanyakubja, it was the capital of Emperor Harshavardhana of the 7th Century. Kannauj was separated from the district of Farrukhabad district and formed as an independent district on 18th September 1997. The major attractions here are the ancient Ajaipal temple, attar manufacturing industry, the 500 years old Siddheswar temple and the Government Archaeological Museum which exhibits ancient pottery, coins, pre-historic bone implements, terra cotta figurines of Gods and Goddesses etc. The place is also a famous for the Perfume production place right from the days of Harsha.